I asked the mods to lock my previous one to clean up and start over. I needed to refresh it a bit. So please: If you have a comment; send me a PM, K? An Experimental Infantry unit, developed to produce the Krieg version of Tempestus Scions, as a further improvement upon Krieg Grenadiers, lowering costs for raising new regiments, improving survivability and creating the next generation of Krieg Infantry. Indoctrination and Training Process oversaw by Magos Biologis, Adeptus Astra Telepathica, and various Astra Miliratum experts on Hive 005 "Nachtstadt"
Raised as the 945th Storm Infantry Regiment, adept at trench siege warfare as Krieg but able to think in a logical and strategic manner beyond the tactics of a battlefield or simple orders. The 945th Storm Infantry Regiment was announced Twice-Dishonored: All Krieg Regiments are dishonored but this one managed to score anouther dishonor before Krieg and it's traditions (The Incident Stated Above) and consequently was disbanded into Companies that were sent as attachments to existing Krieg Regiments. The Regiment will be reformed after redemption before Krieg. Until then, any Death is not considered Martyrdom. Progress, Failure and Results of Initiative were Archived for unlikely future attempts. Some Units were also added into the Company as reinforcements and due to its semi-autonomous nature, are unlikely to be moved out of. Current Hauptmann of the Company, highly pragmatic leading to apparent lenience compared to other Kriegers so long as the combat effectiveness of the company and the Guard as a whole increases. Enhanced Understanding and wielding of Social Skills allow this unit to make a highly charming and suave manners combined with a heavy leaning on Logical Conclusions and Vast knowledge on all manner of things create a rather easy-to-talk-to individual able to observe patterns and point out at possible improvements. Even though this Approach is rarely used. Do not be mistaken; He is still a Kriegsman and will do all that is necessary to improve Guard's desperate situation. Highly Trained Scout Unit with increased expressiveness; so much so that she is able to converse regularly with the Non-Kriegers on base. Life and training on a desolate, empty and downright depressing Planet made her develop a coping mechanism of maintaining a chipper personality and limitless curiosity to practically almost every matter. Her role as Scout Unit made her a valuable asset, avoiding many dangerous situations thus maintaining an abnormal lack of facial scars. Beneath her husk, like in all Kriegers, lies a Combat Automaton triggered by... well... Combat. Continuous fallback on this mechanism created an odd phobia of all other Kriegers especially from the 554th. Location: 1st Squad 3rd 'Foot Recon' Platoon. Unit Assigned into the Company following the Mediace Tent Incident and subsequent Trial resulting in a Dishonourable Demotion. Able to formulate higher thinking skills but wasted away on a Highly Aggressive Behaviour. Currently under reeducation and retraining to root out insubordinate tendencies to avoid a repetition of the Mediace Tent Incident. Sustains a Peculiar Mutation of changing the Eye Colour at certain circumstances. Location: 1st Squad 2nd 'Storm' Platoon. Unit abnormally assigned directly into the Company following the sudden disappearance of the Unit's previous Host Regiment. Previous Rank was Corporal but uncertainty to the unit's ability to lead Kreigers resulted in temporary Demotion to an Obergefreiter until Unit's full integration. Eager, Adaptable, and probably Malleable enough to be reformed into a proper Kriegsman not being one originally. Combat Results yet to be seen. Location: 2nd Squad 2nd 'Storm' Platoon. Vox-Comm unit of the Assault Platoon. Dedicated, Efficient and Resourceful to the Point. To facilitate proper communications with non-Krieg Units was trained to speak without any Krieg Accent. The Unit was trained enough in Social Graces to act –if not understand- not fully logical actions the rest of the Humans commit, a great boon to improve Inter-Regimental Cohesion which right is severely lacking. 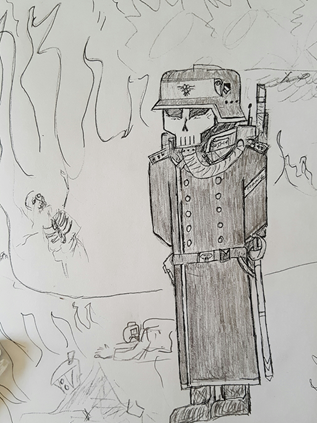 Due to the grievous losses sustained by all Imperial forces, Unit #9453/25 now finds herself being forced to work more and more often with non-Krieg personnel: Be it as assignment to field operations or serving shifts in the Comms Station. Location: HQ Section, 3rd "Assault" Platoon. While each Kriegsmen within the unit has his original Number of birth and designation, the Unit itself uses a different method to number it's troopers: Company Number/ Personal Number -Platoon Number and Company Number and Unit Assignment Number. Unit Assignment Number is used to identify the individual trooper within the squad based on the Assignment and the weapon. Last edited by Johannes Wyss von Krieg on Fri Dec 28, 2018 4:00 pm, edited 21 times in total. In first glance seems like the immovable individual standing before you is either dead or never was alive, that until the Krieger removes his respirator-mask and Helmet: Pale but slightly more coloured skin than standard issue Krieger Infantry. Clean shaven, White hair in a Caesar Cut, carefully combed into the proper position. low and bushy eyebrows. Royal Blue eyes. And a Somewhat Pointy nose. 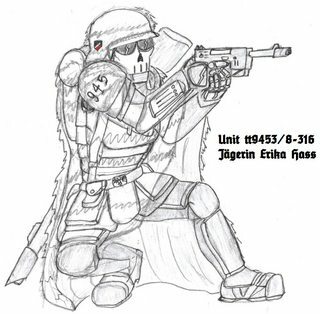 The rest of the body is of athletic build fitted into a Krieg Captain uniform: Black with white trim, Feldgrau Krieg overcoat, Black Metal Plated Gloves, High Boots. Krieg Carapace Armour goes above the Uniform and under the Greatcoat. One well Crafted Bionic Right Arm. Overall: exceptionally well groomed, clean, equipment in perfect condition & maintenance. Vat-Grown into Service of the Imperial Guard on the Death World of Krieg in hive 05, port and planetary defense platform completely blocked the already obscured sky, making the hive live in an eternal night. 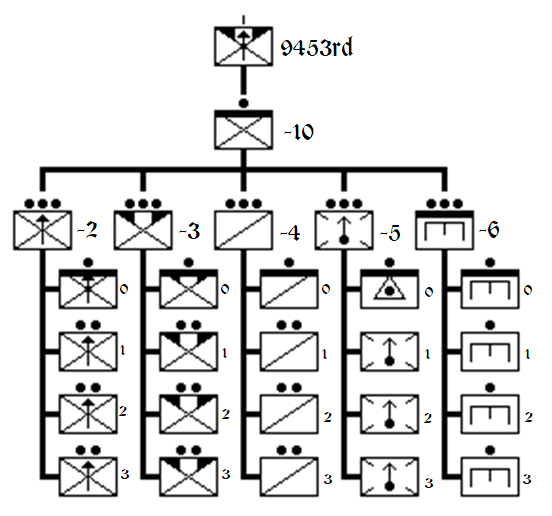 The Candidate was the first to be sufficient enough from physical standards and was the first to be granted a Number as part of the 945th Storm Infantry Regiment Initiative: Meant to improve upon the Traditional Infantry, in a more mobile way of attack and a decentralised chain of command, self thinking was allowed to a certain point for more logical manoeuvres and planning instead of massed attacks on an open field or Attrition Warfare against FRAKKING SELF-REPAIRING NECRONS! Candidate 945/1 was from the batch intended for the commanders of the regiment, and proven to be adequate enough to not be discharged -or in other words, killed-mid-training. Other candidates came and went but Candidate 945/1 met with the required standard, above and beyond for each step of the testing. With time, the Candidates were split into Battalions, Companies, then into Squads then into specific tasks within the squad. But until then, the Candidates must be able to fill all expected ranks should the need, or casualties, require. The Training was a combination of not only Physical and Mental stretching the limits of Human capability like other Krieg Troopers but also direct programming of the brain function with Psyker Assistance and oversight -to the extent that in Tactical Situations, if the Trooper felt or wanted something then it was a direct order from the programmed subconsciousness to act according to the special doctrine -the troopers were to act without deduction or thinking, that was already done for them. It decreased reaction time significantly and was overall a success. 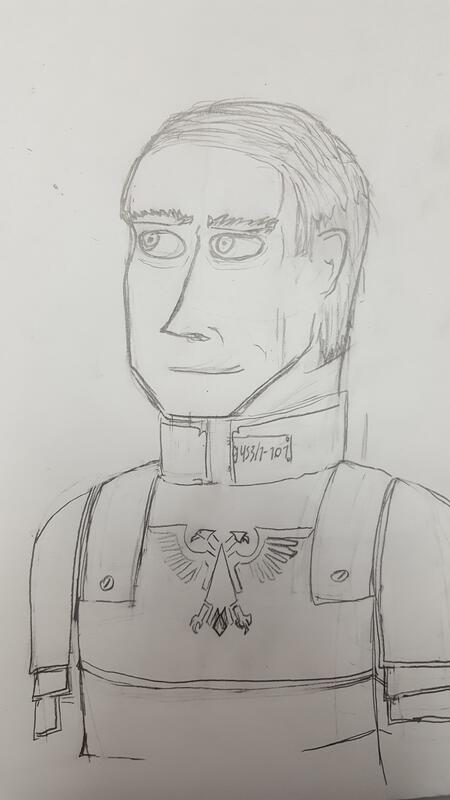 The Digits to the deployment Number were added according to the aptitude to the rank until Unit 945/1-101 was fully ready, the unit was the most successful of the initiative and was chosen to be the Colonel of the 945th Krieg Sturm Regiment, and a name was allowed to be chosen: Johannes Wyss. The Regiment was announced a Success, and a target for it's deployment was decided. But in the Graduation Ceremony the eventual fate was sealed. A Disgracing [[Redacted]] Incident occurred. The 945th Krieg Sturm Regiment was announced Twice-Dishonoured and disbanded into Companies that were sent to support existing Regiments. Johannes Wyss, now Captain Johannes Wyss was dispatched to lead the 3rd Company and reinforce the Imperial Positions on Valmaria against the Xeno threat after the costly planetfall operation, he was instructed to keep the losses of his unit to a minimum -Any death before the first Redemption could not be considered as Martyrdom. As a Company Designated for Storming such a mind breaking task was considered an apt punishment. The 9453rd Krieg Storm Infantry Company was Attached to the 554th Krieg Regiment as Auxiliary Attachment upon arrival, subservient to the "D" Company and fully classified as 9453/554. 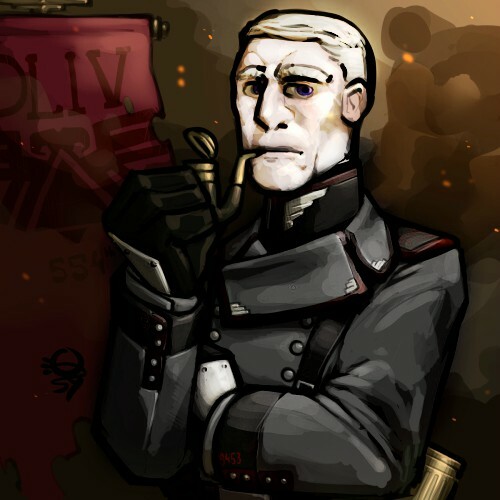 All Imperials are considered "Allies" yet few Long Lasting Connections as befits a proper Krieger. Unlike Kriegers, is very socially capable. Those who consider the Battlefield Alone are constricted to Tactical thinking. The Real Strategists are those who leave the Planet and Themselves still useful to the Imperium. Unit #9453/1-101 is in his core a Krieger. If the long term goal is worth it, no sacrifice is too great for the Price of Loyalty and a Worthy Martyrdom. Every Campaign is evaluated by the End Goal, No one looks at the methods and whose shoulders are rubbed in the process. Note: Will not be used on Mission but beware his strong Right Hook! Last edited by Johannes Wyss von Krieg on Tue Feb 19, 2019 1:09 am, edited 9 times in total. Additional Frak Points / Medals! When the Respirator Mask is on, this Krieger Sharpshooter has a Deathly grim visage from the front, and a shifting Ghostly guise from the back. The Respirator Mask and Stahlhelm cover the face & head with a pale white skull, and the rest of the tall yet solid body is fitted into a Short Krieg Uniform of Black and Grey, Black Metal-plated Gloves and High Boots under a Krieg Sturmtrupper armour -if the features were not distorted by the Camo-Cloak that extends from the collar and goes over the Metallic Rucksack, which contains the necessary respirator parts and a small VOX Unit -its antenna slightly extended. 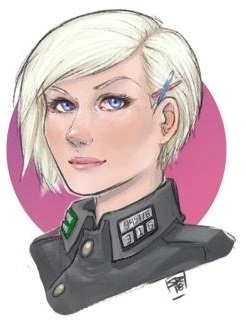 Once this Sharpshooter takes off the Mask, a Pale Oval Face emerges, with Sapphire Blue eyes, Dainty Nose, Close Brows, white hair in bob- carré cut whose left side held by a small Hairpin to hold the hair behind the ear. When embarked on missions, the Camo-Cloak extends to cover the front of the body and over the helmet - leaving the haunting White Skull Mask. As part of the 945th Experimental Krieg Infantry programme, #9453/8 was trained to think more independently than the Krieger Counterpart. 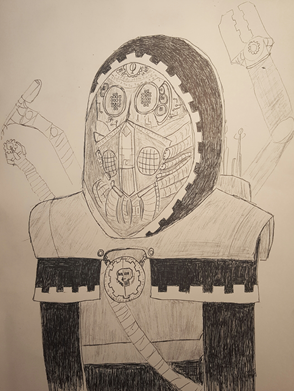 Out of the entire regiment, she was proven to be the most able in infiltration tactics of enemy trenches, as well as the closest to "Human" a Kreiger is ever going to get: A disputed success among the Krieg Gene-weavers instructors and Magos Biologis, some say it's a failure as she does not fully follow the Krieg doctrine on interacting with non-Krieg Personnel, others say the small failures of character installment are outweighed by the success of creating a merging of Krieg-Cadian Storm Troops, as well as the huge investment does not allow the termination of the project. Vat-specimen #9453/8 was created as replacement to the losses of the regiment sustained mid-training and reached full maturity years after #9453/1 , yet she always saw him as the father figure for her, who managed to get the most combat ability out of her -time and time again saving her life: either from combat scenarios or Routine Discipline checks. The indoctrination process was hard, but #9453/8 managed to get herself to the minimum required out of Krieg Korpsmen, finally allowing her talent for sharpshooting and infiltration tactics to be noticed, this solidified her role in the 2nd Platoon of the 3rd Company under #9453/1-101. #9453/1-101 Cpt. Johannes Wyss - Father Figure for the Regiment Company including herself; stern but just. Does his best as in all things, even if lacking in full Understanding of her condition. #NC76-8117-25 Nat Clesh ‘Mad Hatter’ - An unexpected contact originating in some sort of a social role-playing game, occasionally may call each other "Sister" despite lack of Direct Familial relation. Designated "Friend". Kira Belvanette - Another Unlikely contact, thought her proper nail clipping and what is 'Style'. Designated "Friend". #28-D-0715 Drocol Ritter - Drocol Ritter deeply harmed the unique connection between the two Units, #8-316 does not consider him someone worth of the Effort she put in him at the first place. What outside Krieg might be a respectable age to already mature and be an adult, unit #9453/8-316 clearly did not have enough time to do so considering 40% was used for sleep and 50% on training leaving the Kriegerin with an exceedingly young and oblivious personality, harshly tempered and limited by her upbringing which caused her to develop a coping mechanism and remain almost always happy. Life on Krieg is bleak and colourless, the individual will is crushed and innovation is ignored. Now free of physical restrictions and able to participate in social encounters with other regiments, this unit will search every nook and cranny to learn more. Under her husk of a Character, Unit #9453/8-316 is Still a Kriegerin. A Fallback mechanism tailored her brain to direct Automated actions, sometimes even fully taking control of her if Erika herself is found insufficient to the task. She is a prisoner inside her own body, seeing every detail and unable to do differently as Every Action committed is completely logical and justified by an Automaton of War. Aspect: Neva' seen a Sneaky Kriega! Except for crossing no-man-land, Kriegers are not trained for stealth. This one learned it to remain alive: Sneaking away under quarantine, evading lines for training, and all the things that while those bred to die might find useless -she found life saving. Erika never truly experienced the world outside her own regiment , only glimpses at best leading to a mostly professional conduct on the battlefield. This Drocol experienced more than she could ever hope for but his combat behaviour is highly uncontrollable. They were made for each other. Unit #9453/7-316's behaviour and speech very depends on who she is with, when required to speak with Officers and other Kriegers, she manages to mimic the dispassionate and clinical manner shared by all Kriegers though it puts her in a slight mental strain. When in an uncomfortable situation, she tends to retreat back into a very polite form of speech but if spoken to plainly and in a cordial manner, prepare to have the surprising light-hearted response. Unless combat is in any way involved, the Combat Fallback Mechanism is a slippery slope into being a fully fledged Krieg Unit. Last edited by Johannes Wyss von Krieg on Wed Jan 30, 2019 2:15 am, edited 44 times in total. Training: Like Warp he's gonna tell you! 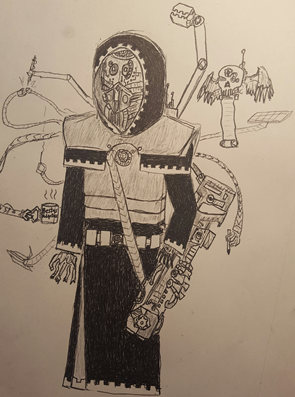 This shifty individual wears Black Robes and basic metallic Warplate of red tint over it, making him barely distinguishable among the unit of Kiregsmen he's assigned to, but the White Cog Trim of his robes and Mechadendrites emerging from his back plate indicate him as a Tech Priest. His Hands are mechanical and the entire face is either fully covered or replaced with machinery; the lower nose and jaw are replaced with a Vox, breathing and sensory unit. The Eyes are replaced with 2 main sensory sight lenses and 4 assisting sensory eyes, the Tech Priest's centre of attention is projected via blue 8bit pattern on the lenses' black field, imitating oval pupils, the pupils are not actively part of the requirements to the Tech Priest's sensory systems and he can control them at will, but he uses them regardless, perhaps as an easier way to communicate with non-Mechanicus. The Robes are Triple Layered, each layer hiding metallic skin exposed by movement, the Tech Priest can use the Robes as a way to hide his mechanical components and blend into the unit of Kriegsmen he's attached to, disappearing from sight of both the Xenos and other parties, hostile nonetheless. In need, the Robes can be readjusted to their other side, making the Tech Priest look like an ordinary Red-Clad Martian. Born on Stygies VIII, Stagsimus Pratextus was educated by the Xenarites. Whose Tech-Priests have a certain fascination with Xeno Tech, Stagsimus is no exception, although His passion to the inner workings of the machines and their spirits, especially finding parallels between Imperial and Xeno Machinery made him distinguish himself among others of his class' more exploratory or archaeological nature, preferring to work with existing knowledge and investigating the machine mysteries deeper rather than engendering himself with waking up slumbering Necrons or observing Orks while bashing them over the head with a power axe, for this: Tau Technology was perfect, no STC's being corrupted by Warp or not working without an Ork's hand with it, all Stagsimus needed to do is figure out the function of separate components in a Tau mechanism with the trusty help of many many Servitors and a heavy blast resistant glass separating them. And then replace said components with Imperial Parallels made from STCs, attempt to modify the STC (With a Copy of course) based on the Xeno Tech, but this time: Actually tend and nurture the Machine Spirit! 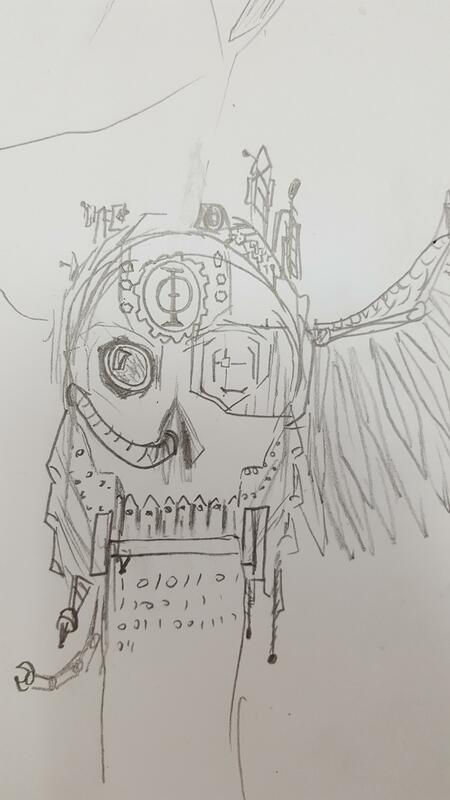 Prototypes varied on success but at least Stagsimus attempts and results were visible, at least to the Xenarites, any other Tech Priest will incinerate him for Techno-Heresy no matter how beneficial or strict to the Mechanicus Principles it may be. Such passion was noted and the relatively young Tech Priest was elevated to the rank of a Data- Predator as an assistant to a senior Magus who decided to mentor him. The War with the Tau Empire came to Valmaria, bringing ample opportunities of salvaging their Tech, Stygies VIII sent several of their Tech Priests and Magi to the System. The Magus was heading the Stygies VII Contingient sent to Naris as part of their own vision of the Pursuit of Knowledge, unfortunately, he was killed along with the High Command by the Tau Assassins while Pratextus was on an assignment. -Examination and analyzing tools for Tau Weaponry "Disposal"
-Meant to disable or even take control of enemy technology (although the Arc effects on flesh-based hostiles are rather amusing). 3rd Mode is self-destruct button, Firing Tau Ammunition straight into the Permacapacitor. -Note the weapon machine spirit is very unstable due to it's origin, this is used in a safety mechanism that installed in the case when the weapon falls to enemy or non-Xenarite Mecahnicus hands: It self destructs in a violent Arc explosion aimed to kill the thief and everyone around in a radius of 10 meters if the machine is not sated. High Concept: Almost Heretical, but not yet! And knowing this makes it forgivable! Aspect: Xeno Tech is still Tech, Let's Hack it's Machine Spirit! Regiment: 584th Callistian Infantry Regiment, '2nd Sons' Section. Though one day his hair was black and fair, now it is greying at a considerable rate, showing signs of white at the roots, though it remained in regulations, As it should. Though one day his eyes showed optimism and grace, today they are deep green housing deeper hatred. 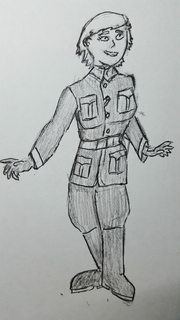 He maintains his kit and uniform by himself with no need for servants wasting air, he wears a Tunic, painfully white like those of the 2nd sons but unlike theirs -His stays dry at any occasion, perhaps due to House Montgomery's choke-hold on Callistia's Fabrics and Chemical Industry. Hanging from his neck is a Golden Gorget bearing his venerable House's Crest. His family equipped him to the best of their ability in hopes that he would at least try to represent them with grace - Montgomery is determined to defy them. The Name "Montgomery" goes far and wide back on Callistia: A House of much Honor whose demands few would refuse. When the House demanded their back then teenaged misbehaving scion be put as far away as possible, the Planetary Munitorum diligently complied with their main source of ink's kind request. Only once did David return home, and that was when of his original regiment remained only cripples and bones. He was neither - And so was fit to assist the command staff of the new 584th Callistian Infantry Regiment. Enemies: Snotty Noble Loin-Spawn with nothing between their ears unworthy of their title, Heretics, Traitors, Xenos. Friends: Proper members of High Society -those who are worthy to represent and lead the Imperium. As a True Aristocrat, David truly believes the Nobility deserves an elevated place above the common rabble but not for the blood they have but for the use they put through. A better People should be Treated Better because they are Better. Be it ingrained arrogance to notice lessers succeeding or the 'Do it Yourself' attitude to see his peers enjoying unearned pleasures, Montgomery has marginalised himself away from both extreme sides of the social spectrum, turning into the reaper each other wishes would visit the other one. Aspect: Harder! Better! Faster! Stronger! The man does not pull his punches and Strongly Encourages his peers to do the same, pushing them to the absolute best they could possible be because that is expected of them. "Violently Imparting Wisdom" as he calls it.